Stop saying: “No thanks, I’m good.” Receive the help already! 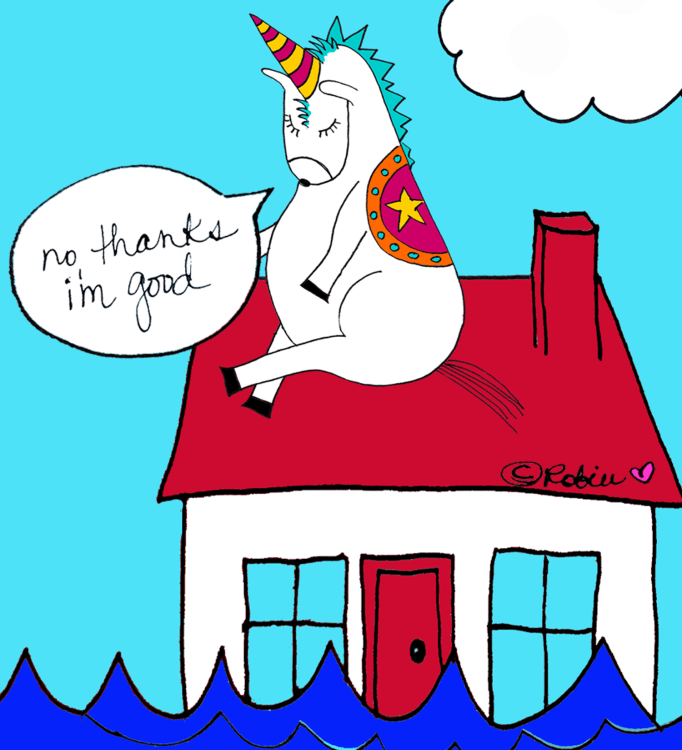 Have I told you about the time Corni got stranded on the roof during a flood? It was early spring, and it had been storming a lot that week. One afternoon, there was so much rain, Corni’s house began to flood. Eventually, the first floor filled up with water so he decided to climb up on his roof to stay dry. Corni was very scared and so he began to pray. 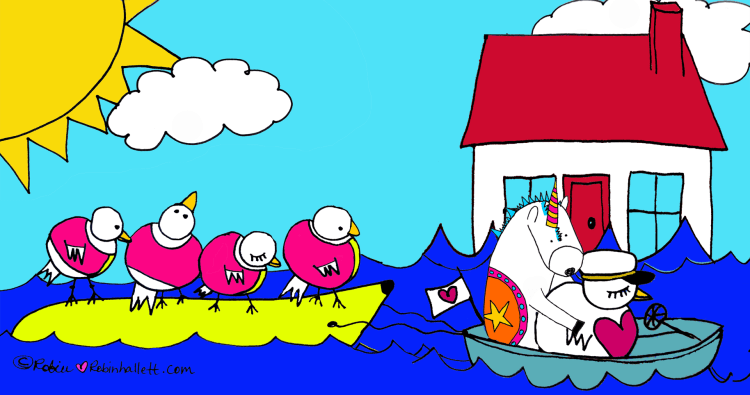 Just then, his friend Birdie happened to be rowing by in her boat. For a split second, Corni thinks about it but decides to stay put, “No thanks, I’m good,” he says and he sends Birdie away. Have I mentioned that Corni does not know how to swim? Right, that’s important… he can’t swim. He tried to learn how a few years back at the YMCA but it didn’t take. A few hours later, the water has risen a significant amount and he is beginning to panic. He’s also feeling pretty stupid, I should have taken Birdie up on her offer, he thinks. Next thing he knows, Birdie is back with a bigger boat. This time she’s got the big one and she’s towing people from the neighborhood along on a banana boat. There’s music playing, they’re laughing and having fun. It’s at this point in the story when people usually say, what the heck is wrong with Corni? Why won’t he take the help? Oh I understand Corni very very well. He’s afraid to say yes. He knew he should have said yes, he knew. But in those moments when Birdie offered him help, he could not get his mouth to operate correctly, he just couldn’t. He was feeling small and awkward and uncomfortable and scared. Too scared to take the help. He just couldn’t receive it. He was feeling too scared about what might happen if he said yes. Lucky for us all, life gives us plenty of chances to practice. Not too long ago, my power went out and I had to ask the neighbors to help me… and after that I burned my hand at Camp GLP and had to ask people to help me get dressed and pack my luggage and then I missed my flight home and had to ask strangers at the hotel to do the same. But some of the hardest times I remember having to ask for help was when my mother was dying and I was alone trying to make it all work. I don’t love the feeling of awkwardness and vulnerability. 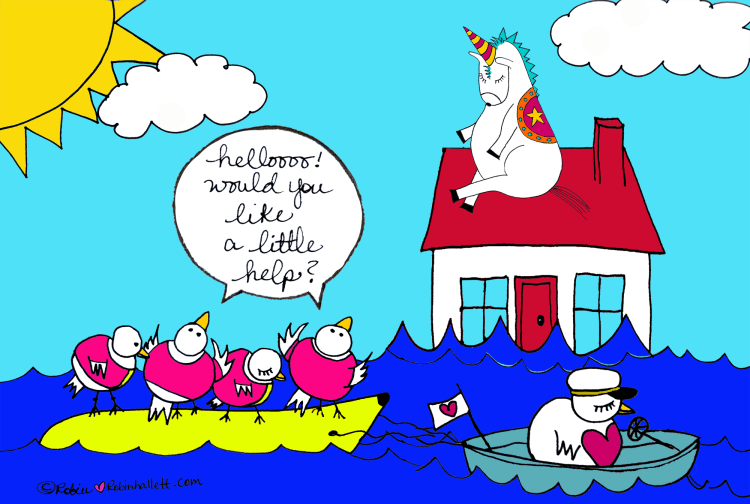 I don’t love it when I receive help and find out there are bizarre strings attached. I don’t like it when people disappoint me or laugh at me for needing help… I was often teased by my family for crying and being vulnerable… I do not enjoy opening myself up to this possibility again, no I do not. And at the same time, I am clear I cannot do this life alone. I want to balance my ability to help and to receive. This is all getting easier, all the time. I want my heart to be a good receiver. Let’s practice receiving. Stop saying: “No thanks, I’m good.” Receive the help already! 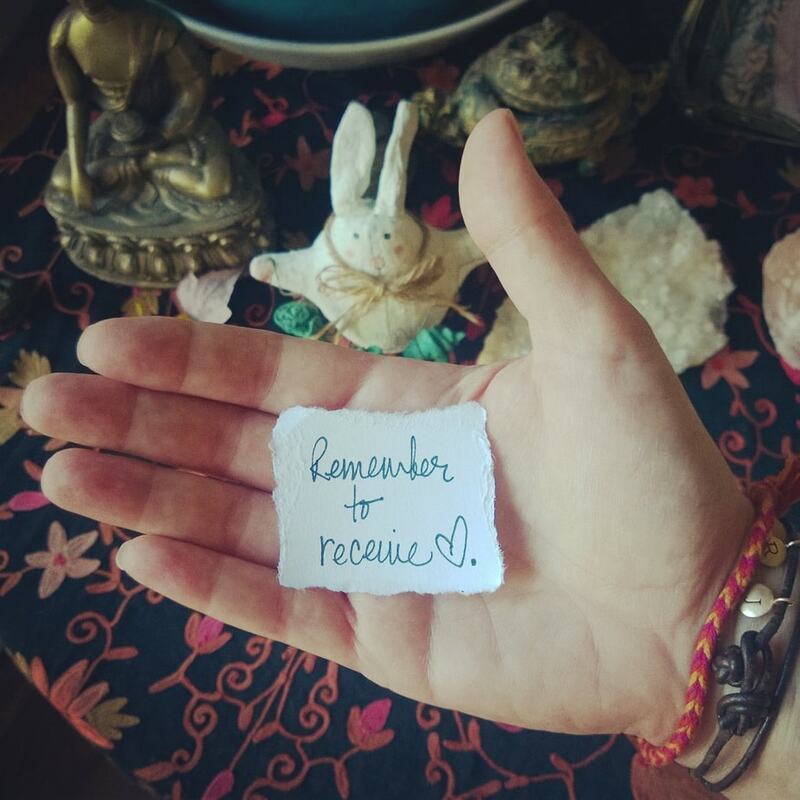 I promise if you decide to do better with receiving support, help, assistance, answers, solutions, hugs, back rubs, whatever… if you decide to let that in, the world will not collapse on you. There is no other shoe that will drop. That is the story you tell yourself so you can stay a safe, contorted party of one. I need help from time to time and it’s okay. Hello, I need a little help here. Can you help me? (random stranger) It looks like you could use a little help. (you) Why, yes, I do. Thank you. Please stop holding yourself up. Let someone take your hand once in a while. And, so what if they don’t know how to do it or say it or be it perfectly. Guess what? Neither do you. It’s a process. We are learning to do this. Coming into balance is a good thing–we want to balance the giving with the receiving. Don’t be a lopsided lover! So, are you wondering what happened to Corni? Did he ever get himself off that roof? First of all, Birdie is a good and patient friend. I am going to be speaking to receiving help over the next few weeks, so if this is an important topic to your healing journey, please don’t miss out! 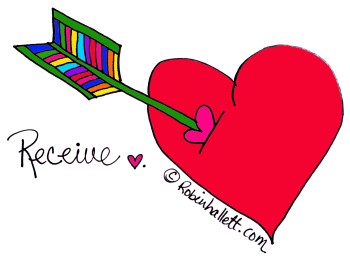 Make sure you join the Love Posse. See that bright orange box?